Stuff far ‘way but not nearby? The return! This episode has a shorter main segment in favor of having some new news, all of them sent in by listeners. In the episode, I address a claim that I hear in many different contexts that basically boils down to, “How can we know about far away stuff but we don’t even know about close stuff!” I provide two examples, many analogies, an experiment you can do yourself, and my usual dry, witless humor. The logical fallacies segment discusses the False Equivalence fallacy. For the New News, I talk about the exosystem discovery by Kepler that made the news in mid-October, space law and possible violations by bills in the US Congress, and the new farthest known object in the solar system. And yes, this is episode 144, there has not yet been an episode 143. It will come out “soon.” Where “soon” is an undefined unit of time, and it will be back-dated to November 1. Are We on the Verge of Discovering an Earth-Like Exoplanet? I announced awhile ago that I was on episode 347 of the Canadian, “The Reality Check” poscast where I talked about exoplanets and some hype — deserved or otherwise — about almost but never quite yet discovering Earth-sized exoplanets. There’s lots of ways to talk about exoplanets, but I’m going to take the traditional approach and start with a very broad but brief overview of how we have found the few-thousand known extra-solar planets, or “exoplanets” for short. There are five main ways. The most obvious is the most difficult: Direct Imaging. This is where you take your telescope and would look at a star and see the planet around it. This is almost impossible with current technology, and we have less than 20 exoplanets found this way. It’s so hard because the star is so bright relative to the planet and because most star systems are so far away. And obviously, if the planet is larger and farther away from the star, it’ll be easier to see. The second main method has also only produced about 20 planets so far: Gravitational Microlensing. Einstein showed that large masses bend light, and we can see this in space when an object that’s far away passes behind a massive object that’s a lot closer. The light from the background object gets distorted and magnified, much like a lens … a lens caused by gravity. If the foreground object happens to be a star, and that star has a planet, then that planet can make a detectable contribution to the lensing, not only in amount, but in the exact shape of the lensing effect. The earliest actual successful method was a special form of what’s called the Timing Method, specifically in this case, pulsar timing. Pulsars are incredibly dense stars called neutron stars, and we get a blast of radio waves every time one of its poles sweeps in the direction of Earth. These are so regular that any tiny perturbation can be detected and attributed to something weird, like a tiny planet tugging on it and so changing that regular spinning signal. This is the same concept as the highly successful method that found the most exoplanets until a few years ago: Radial Velocity. The idea is that we normally think of a planet, like Earth, orbiting the sun. But it doesn’t really. It *and* the sun orbit a mutual gravitational point called the “barycenter” that is between the two. For Earth and the sun, that point is VERY close to the sun’s center, but it’s not quite in the center. That means that over the course of a year, as Earth goes around that point, the sun will, too (on the opposite side of that point). So, it will wobble very very slightly as it orbits the barycenter. We can’t possibly observe this tiny tiny motion of other stars. BUT, we can use the light that star emits to do it by using the Doppler shift. That’s the phenomenon where if something is moving towards you, the waves it emits become compressed, and if it’s moving away from you, the waves get stretched out. The common example is a train whistle going from high to low pitch, but in astronomy, this is where the light is shifted to blue and then to red. So, if the planet around another star is at its closest point to us, the star emits light and we see it all normal. As the planet starts to move away from us, the star starts to move very slightly toward Earth, and so its light will be very slightly blue-shifted. Then, the planet gets to its farthest point, and starts to move towards Earth, which means the star starts to move away, and we see its light red-shifted. This is an incredibly tiny effect, and the smaller the planet, the smaller the shift in the light. Or the pulsar timing change. There was a lot of progress throughout the late 1990s and early 2000s in very high-resolution spectroscopy in order to get better and better at observing smaller and smaller planets. The easiest ones to observe are the largest because they make the biggest shift in the star’s light, and ones that are closest to their star are easier because you don’t have to observe as long. To observe a planet that has a 10-day orbit, you just have to observe that star for about a month from Earth to get decent statistics. That’s why all the exoplanets discovered early on were what are called “Hot Jupiters,” since they were very large and very close to their stars. The final method is the Transit Method. If a fly passes in front of a bright light, you can see a slight decrease in the light. If a bird passes in front of a light, you’ll see a larger decrease in the light. Same thing here: A planet passes in front of the star and temporarily blocks part of the light from the star that we would see at Earth. The big issue with this method is that you have to have the fortuitous geometry alignment where the planet’s orbit is just right so that it passes in front of its star as seen from Earth. The first one wasn’t detected until 1999, but a decade later, the dedicated spacecraft COROT and then Kepler were launched to look for these, monitoring the same fields of the sky, tens of thousands of stars, moment after moment, looking for those brief transits. In 2014, Kepler released over 800 planets discovered with this method, more than doubling the total number known, and that was on top of its other releases and, to-date, it’s found over 1000. The transit method, despite the issue of geometry, is probably the best initial method. If you have the planet going in front of its star, then you know its alignment and you can follow-up with the radial velocity method and get the mass. Otherwise, the radial velocity method can only give you a minimum mass because you don’t know how the system is oriented, you only know that radial component of velocity, hence its name. With the transit method, you can see how much light is blocked by the planet. Knowing the star’s type, you can get a pretty good estimate for the star’s size, and knowing how much light is blocked means you can get the cross-sectional area of the planet and hence its diameter. For example, Jupiter would block 1% of the sun’s light, and since area is the square of length, that means Jupiter is about 10% the sun’s diameter. Since the sun is a type G V star, we have a good model for its radius, though of course we know its radius very well because we’re in orbit of it. But that means not only can we get mass, but we can get size and density. The transit method also lets us see if there’s a large atmosphere. If the light from the star instantly blinks down to the level when the planet passes in front of it, then any atmosphere really thin or nonexistent. If there’s a gradual decrease, then it’s extended. If its extended, we can follow-up with something like the Hubble Space Telescope and actually figure out what that atmosphere is made of by looking at what colors of light from the star are absorbed as it passes through the planet’s atmosphere. And as with the radial velocity and timing methods, we know how long it takes to go around its parent star, and along with the star’s mass from what kind of star it is, we can get the distance of the planet from the star. Okay, so much for a brief overview. But for me, I’ve left out a lot. Moving on, it should be somewhat apparent that the bigger the planet, and the closer to its star, the easier it is to observe with pretty much ANY of these techniques, except direct imaging or microlensing where you want a big planet that’s far from its star. Big means big effect. Fast orbit means you don’t have to observe it for very long to show that it’s a regular, repeating signal best explained by a planet. So, the question is then, can we detect an Earth-sized planet, and can we detect an Earth-like orbit? These are really two different questions and they depend on the technique you’re using. If we want to focus on a the two main methods – radial velocity and transit – then the unsatisfying answer to the second is that we do finally have good enough technology, it is just a matter of finding it. With the 2014 Kepler data release, there were over 100 exoplanets that are less than 1.25 Earth’s size. With the 2015 release, there are a total of 5 planets smaller than Earth or Venus, but they orbit their 11.2-billion-year-old star in just 3.6 to 9.7 days. Even if we have observations for more than a year or two, for something as small as Earth, the level of signal relative to noise in the experiment is still pretty small, and you want a big signal relative to the noise. It’s best to build up multiple years’ worth of data to average out the noise to be able to really say that we have an Earth-like planet. For something like Jupiter, which orbits our sun in about 12 years, we’d need to observe at least two transits, meaning we’re just now approaching the time when we would have a long enough baseline of data with some ground-based surveys, but that’s also assuming we catch that planet for the few hours or days when it goes in front of its star versus the years and years that it doesn’t, and that we do this repeatedly and don’t chalk it up to sunspots. This is why we really need long-term, dedicated surveys to just stare at the same place in space, constantly, measuring the light output of these stars to see if we can detect any sort of dimming, that’s repeated, from a likely planet. But, even if we find an Earth-like planet in terms of mass and diameter and location in its solar system, that’s not enough to say it’s Earth-like in terms of atmosphere and surface gravity and overall long-term habitability. It’s just a first step. A first step we have yet to truly reach, but one that is reasonably within our grasp at this point. But it’s from the existing planets we know of that we get some of the hype that hits the headlines every few months, like “astronomers estimate billions of Earth-like planets exist in our galaxy alone.” I’m not going to say that’s fantasy, but it’s loosely informed speculation based on extrapolating from a few thousand examples we now have from a very, VERY young field of astronomy. Or, we’ll get articles where the first sentence says, “Astronomers have discovered two new alien worlds a bit larger than Earth circling a nearby star.” It’s in the next paragraph that we learn that “a bit larger than Earth” means 6.4 and 7.9 times our mass, and they orbit their star in just a few days. So as always, this is a case where, when we see headlines, we need to be skeptical, NOT susceptible to the hype, and read deeper. But that said, it is entirely possible that any day now we will find an exoplanet that is at least like Earth in mass, size, and distance from its host star. Episode 348 of “The Reality Check,” a weekly Canadian podcast that explores a wide range of scientific controversies and curiosities using science and critical thinking, is posted, and I take the first (and longest) of the three segments, where I discuss exoplanets. I was originally contacted to discuss this topic because the hosts had some skepticism about the hype that we get every few weeks or months about how we are just on the verge of discovering an Earth-like exoplanet. The issue is that “Earth-like” can have a lot of different requirements and qualifications: Do you mean Earth-sized? Earth-like orbit? Habitable zone around the star? Atmosphere like ours? Etc. Unfortunately, for my linear thinking, that meant I had to spend about 20 minutes going through an overview of how we find exoplanets, what the limitations are of each technique, and what information about the planet each technique can give us, and how different techniques and follow-up observations can be used to give complementary information (for example, if you detect an exoplanet using the transit method, you can use the radial velocity method to get the mass of the planet, and if you detect an atmosphere with the transit method, you could use spectroscopy with the Hubble Space Telescope to measure the atmosphere’s composition). And for the record, when I practiced the segment without interruptions, it was 11 minutes. It stretched into almost 30 minutes on the show. And for regular listeners of TRC, you should recognize a quote from former-host Elan (I think) that I incorporated into the end of my segment. It was toward the end that I finally got to the question about whether media reporting is hype. And, to put it concisely: Yes. But with that said, we really do, at this point, finally have the technology to detect an Earth-sized planet (and have) in an Earth-like orbit (have not) with potentially an Earth-like atmosphere (have not, and this tech may not *quite* be there, but if it isn’t, it’s close). I haven’t listened to it yet, but of course I was there when it was being recorded, and I don’t remember embarrassing myself too much. They do tend to all talk more slowly, though, when recording at 1x versus how I listen to podcasts at about 1.2–1.3x. Also, three of the 4 outtakes (they have outtakes at the end of the show) are things I said or contributed — I guess I was humorous (or humourous? since it’s Canadian?). I will add that doing a panel show is VERY different from doing a monologue as is my normal podcast. Or even doing an interview on the podcast. The dynamics are (obviously) completely different, and you almost have to build in pauses to what you’re talking about in case of questions from others. I think I stepped over some people, too. For example, there was one point maybe half-way through my segment where I stopped and asked if anyone was there because I wanted to make sure my internet connection (and theirs’) was still up since we had been having issues. They were all there, but then there were something like 3-4 questions that they asked because they had just been developing while I was talking and not pausing enough to let them ask. If they’re kind enough to invite me back, I’ll keep this in mind and build that in. And work more at editing myself down. Oh yes— There were two other segments. One was a guessing game as to “which came first,” while the other segment was about whether you should plan to visit Israel last if you go to the Middle East because other countries won’t let you in if you have an Israeli stamp in your passport. By budding off a young Sun? Or, does that not work? Several corrections and additions from the last episode form the lead-in to this one, going from forming the moon by budding off Earth to forming planets by budding off the Sun. The vast majority of this episode is a discussion of the material by the late Tom van Flandern, who was probably the most recent and vocal advocate of the model, excluding one with whom I was promised a debate that has not yet materialized. This episode gets us back to the ~half-hour format, though besides the main segment, there is only some feedback and brief announcements of some upcoming interviews. More on that when they happen and are posted. Sorry the blog’s been a bit bare lately. As mentioned in my podcast, I’ve been very busy the last two months. Hopefully things will die down a bit in mid- to late-November after most of my stuff is due, such as three faculty applications. 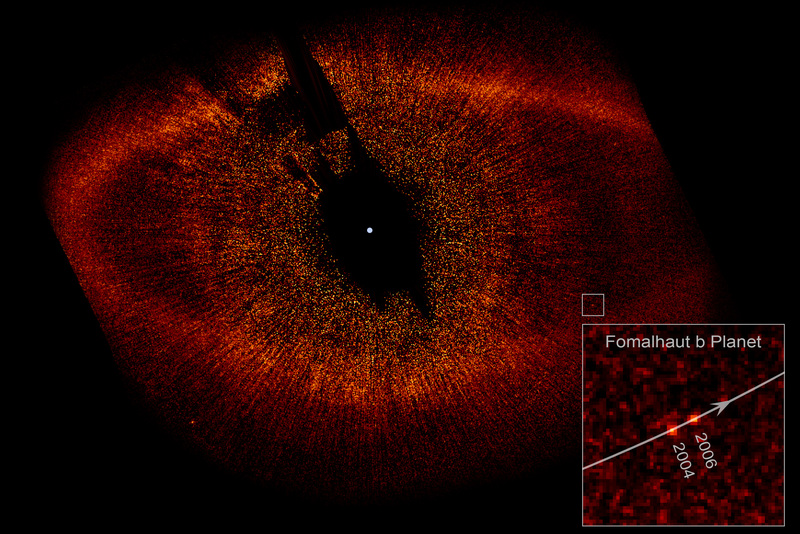 Fomalhaut is a star – a rather bright star as seen from Earth that’s about 25 light-years away. It made headlines in 2008 with the potential discovery of an actually imaged planet around the star. Following convention, the planet was termed Fomalhaut b. However, controversy came earlier this year when, despite the apparent solid observations in visible light, it was difficult if not impossible to be seen in infrared light. It should have been prominent in IR light (which is where most people actually go for direct-exoplanet imaging) because planets are “warm” and so glow relatively brightly in the IR while stars are much brighter in the visible. Hence, the lack of an IR detection raised some significant issues. But, a recent reanalysis shows that it probably is real, it’s just smaller than previously thought. And follow-up observations are being made. That’s what you can get from the neat-o 2 min 08 sec video I linked to. If you watch the video, it’s obviously meant to be humorous and in the spirit common to Halloween in the US. But, if you watch the last 10 seconds, they show a disk-shaped 1950s-style UFO passing by Earth. Yes, obviously it’s meant to be Halloween-y. But I guess when you’ve been listening to and watching conspiracy people for any length of time, you worry that ANY sort of thing like this from any “official” government body, especially NASA, is going to be latched onto and taken as an admission or a leak or whatever to support their ideas. Richard C. Hoagland, Face-on-Mars-guy extraordinaire, has used this many times to support his conspiracy claims. And yet, if you actually WATCH the episode, the entire point was to show the comedy of an argument between two of the show’s main characters, Roz and Frasier, that they are so self-absorbed in their own squabbling that they miss the sensational statement by John Glenn. Conspiracists such as Hoagland, Mike Bara, or David Wilcock miss the entire point that this was a scripted show and not an off-the-cuff admission of ET life. Expat over at the Dork Mission blog has a good summary and goes into a bit more detail about this than I do above. To return to my point, the NASA video is funny, and it shows how science works: This is a process of finding evidence to support a claim, testing it, and trying to figure out what’s really going on. The video was released just a few days ago obviously in the spirit of a US holiday. But just as the Frasier show was clearly scripted comedy but was used by UFO nuts, I worry that a few animation guys having fun may also be used by conspiracy / UFO folks to support their own claims. In my last post, “Creationists Really Don’t Like ET Life,” I talked some about the philosophy young-Earth creationists (YECs) seem to have about ET life and discussed a few specific factually wrong statements that an article from Creation Ministries International had on its website regarding the discovery of the planet Kepler-22b. In the “Final Thoughts” section, I stated that I had submitted feedback to them pointing out the two factual mistakes, and that I would post here if I actually got any reaction. I didn’t expect one. Hi, I just wanted to let you know you have at least two factual errors in your article. First, “astrobiology” was coined in English in 1903 from the French according to the Online Etymology Dictionary (http://www.etymonline.com/index.php?term=astrobiology). NASA was not created until 1958, and NASA’s Origins program was not formed until the 1990s (http://history.nasa.gov/factsheet.htm), well after this term was in use. I recommend correcting your article. All the same, I don’t think there are errors that you claim. It may well be that “astrobiology” is not a new term, but it is a new field of research as the article claimed. Similarly, one could call “computers” a very new development, certainly for most of the public. But the word “computer” is actually over two centuries older than the word “dinosaur”. Kalas also points out there are huge leaps in logic. For example, some astronomers argued that a star called HR 4796 is the right age to form planets, so certain observations should be explained by planets. Kalas points out that this is like a doctor diagnosing cancer because you are the right age to have cancer. The article has now been re-worded a bit to incorporate the above. Is Astrobiology a New Term? NASA’s Origins program is dedicated to looking for habitable planets that might harbor life. Their endeavours spawned a new field of research called ‘astrobiology’, which is to specifically search for the evolution of life wherever it might occur in the universe. A study about life in the Universe [appeared] in a French journal of popular science as early as 1935 (Sternfeld 1935). … As early as 1941 the word “astrobiology’ was defined by Lafleur as “The consideration of life in the universe elsewhere than on Earth.” … The first American symposium in astrobiology was held in 1957 (Wilson, and following papers, 1958) … . Astrobiology is not a science as young as generally thought. Although many extrasolar planets are assumed to exist, we should keep in mind the methods used to detect them. Firstly, we have never witnessed or directly observed (i.e. with our eyes through a telescope) a planet outside of our own solar system. They are presumed to exist through indirect methods of observation. In the case of this latest find, Kepler 22b was detected using the transit method. This is where the planet’s host or nearby star’s light is seen to dim when the alleged planet passes in front of it and between our line of sight from the earth. Although many extrasolar planets are assumed to exist, we should keep in mind the methods used to detect them. Firstly, we have never witnessed or directly observed (i.e. with our eyes through a telescope) a planet outside of our own solar system. They are presumed to exist through indirect methods of observation. In the case of this latest find, Kepler 22b was detected using the transit method. This is where the planet’s host or nearby star’s light is seen to dim when the alleged planet passes in front of it and between our line of sight from the earth. We have not seen the surface of a planet directly. In fact, until recently, not seen stars as anything but points of light. Only in 1996 did the Hubble Space Telescope see “the first direct picture of the surface of a star other than the Sun”—the red supergiant Betelgeuse, 1000 times the sun’s diameter. However, in 2008, a planet was observed from direct light reflection around the big, close, white star Fomalhaut. First, no, I’m not going to respond as I don’t think it’s worth belaboring the point further. I was impressed I got a response at all. I still disagree with the first one on NASA founding astrobiology for the reasons I pointed out above (it’s wrong …). I’m impressed that they actually corrected the other point. It goes from pure denial originally to a basic news report that they seem to be struggling to spin their way but not really being sure how to do so anymore. Originally it was “None exist, we can’t see them,” to “Okay, some definitely exist but we still don’t think these others do and even if we do we can’t see their surface so so what?” It’s potentially colored by my own view of YECs, but it seems like a 5-year-old who’s lost an argument but still trying to stamp away with some thoughts of dignity. Sometimes, I’m fascinated with young-Earth creationist (YEC) positions on certain topics. It kinda falls under the category of “Why are you wasting energy worrying about THIS?” Like with Conservapedia taking the time to complain that black holes are liberal pseudoscience. The issue du jour has to do with extraterrestrial life. For some reason, YECs just can’t even entertain the idea that there may be other life off this planet that did not originate here. I think that the root of this is in a literal interpretation (yes, interpretation) of the Bible. Which shouldn’t be a surprise, but stick with me a moment longer. YECs and other biblical literalists like to say that everything in the Bible is 100% True exactly as it was written by their deity. In the Bible, it apparently says that Jesus died for all our sins and they were all the sins of mankind. Well obviously that means that Jesus did not die for aliens’ sins and therefore aliens don’t exist. Other Bible readers have no problem with ET life, though. They say things like the Bible was written for us and just left out all the stuff about aliens. That believing life isn’t out there is limiting their god because why couldn’t it have created life out there, too? YECs counter that the Heavens Declare the Glory of God (I think that’s a psalm or something) and that Jesus would have had to go to every planet with intelligent life and died for the sins of that species and the Bible doesn’t say anything about that. Since the Bible is a complete record of all that stuff, then since it’s not in there, it didn’t happen (I swear folks, I’m not making this up). I guess that means that cars aren’t real but wizards are. “The Vatican astronomer’s comments about the possible existence of extraterrestrial life are the inevitable outcomes of allowing man’s word preeminence over God’s Word, instead of using the Bible as our starting point with which to interpret the universe.” from AiG. Or “As we’ve written before, the Bible does not teach that God did not create life beyond earth; it is silent on that possibility. Yet, reading Scripture holistically, the implication is that earth (and especially humanity) is at the center of the cosmic stage. That view, combined with the lack of evidence for either evolution or extraterrestrial life, leaves us quite doubtful about ET—truly skeptical, unlike many modern scientists who have put their faith in evolution.” from AiG. “Creation scientists maintain that we will never receive messages or entertain intergalactic visitors from deep space simply because there are no such civilizations out there. “As far as the Scriptures are concerned, they teach unequivocally that the earth is uniquely the abode of man [Psalm 115:16 and Acts 17:20]… It seems grotesque and blasphemous to suggest that the tragedy of Calvary’s cross should be repeated on millions of other planets, for the benefit of other unknown and hypothetical members of God’s creation.”5 Theoretical speculations and imaginative evolution-based predictions aside, all research beyond Earth has shown that when it comes to organic life — we’re it.” from ICR. Does that mean I don’t think it’s out there? I think it’s possible. I think that the study of extremophiles – lifeforms that exist in seemingly toxic environments like extremely acidic or temperatures above boiling or below freezing – is really interesting. I think the recent studies that have found amino acids on asteroids is really neat. I also do think that if life arose here, it’s quite likely to have arisen elsewhere. But that’s really as far as I’m willing to go on the issue. The reason for this blog post is a Creation Ministries International (CMI) article on the subject that came out December 15 entitled, “Has the Kepler spacecraft found an ‘alien world’?” This was followed up today by the Institute for Creation Research (ICR) article “Another ‘Goldilocks’ Planet Stirs ET Hopes” I’m going to focus more on the CMI article because Peter already talked about the ICR one. First, I’m actually a bit surprised it took over a week since the press release for CMI and then ICR to come out with their take on the discovery of Kepler-22b, the first Earth-sized (ish) planet that orbits within the habitable zone around its parent star (the distance needed for the temperature range such that H2) can be in a liquid state). It’s a neat discovery and of course all the news stories – perhaps rightly – played up the astrobiology/ET possibilities. After all, for life to exist as we understand it, we basically need two things — first, a liquid to act as a solvent and medium for metabolic reactions, and second, an energy gradient that metabolic reactions can take advantage of. This may sound different from how you learned it in school (I know it’s different from how I learned it) where you were probably taught that life needed some protection, water, and sunlight. Well, the first isn’t really true (bacteria survived for years on the moon being exposed to the vacuum and radiation of space), the second one doesn’t need to be water but we still think it’s the most likely, and the third one really just means energy where we use sunlight but you could take advantage of favorable chemistry, too, or geothermal heat. Anyway, my point was that the media spin was somewhat hyped, but I don’t blame them. NASA is a public governmental agency that requires the good will of Congress to remain funded and so whenever it can play up stories that are of interest to the public, it will. And a story like that is so much more interesting than Britney Spears being the first person to get a million friends on Google+ that just came out today. This is wrong. According to NASA, the Origins program began in the 1990s. According to the online etymology dictionary, “astrobiology” was formed in the English language in 1903, well before NASA was founded over half a century later (1958). The next paragraph of the CMI article is a not subtle hint that life on Earth is complex and CMI thinks that NASA should be studying that to show that only God coulddadoneit. In contrast, NASA’s annual budget for FY2011 is $18.724 billion. The science division gets $5.006 billion of that (source). I think if a religious organization wants to study life, it has more means to do so than NASA. So stop complaining. Again … wrong. Spend 2 seconds on Google and you come up with headlines like, “Astronomers Capture First Exoplanet Images,” or “First True Exoplanet Images” … you know, vague and hard to understand headlines. From 2008 (this is why I felt it important to point out that CMI’s article was posted on December 15, 2011). The rest of the CMI article is basically reverting to the standard, “Science has made mistakes before therefore what we say God did he did.” Yes, I may be sounding irreverent, but they’re irreverent towards me (or my field, anyway). They also have a whole section on, “Should Christians be concerned by this?” Again, I’ll go back to my beginning statement that this is just one of those cases where I can’t figure out why YECs feel the huge need to fight and argue against it. If the Bible contains everything about the universe, then why doesn’t it talk about computers? But it does imply it’s okay to offer up your daughters to an angry mob. Sigh. But Biblical weirdness isn’t quite the subject of this post. The article as I’m viewing it now has two comments posted. One of them is from Jack of Australia who basically asks about the Fermi Paradox: If aliens exist, then we should’ve found them by now? The author of the CMI article responded and gushed at Jack answering with normal complaints against science. Paul in the UK is the other commenter who just takes the article a bit further emphasizing that us evil scientists will believe anything so long as God is not a part of it. I’ve actually submitted a comment because I find the factual mistakes somewhat annoying. and I’m curious to see what they’ll do. I’m hypothesizing that they will ignore it, especially because I’m putting in my full name. In the event they don’t, then I will post about it. Edited to Add: And here’s the follow-up.